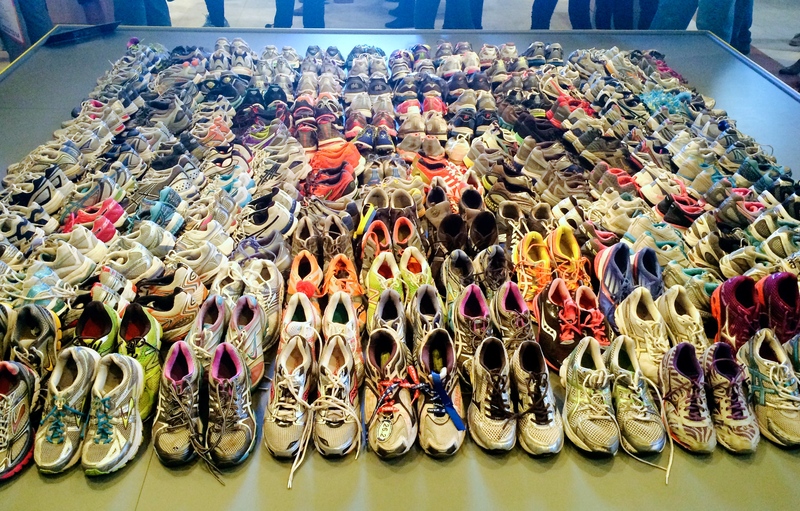 The centerpiece for the April 2014 exhibit at the Boston Public Library entitled Dear Boston: Messages from the Boston Marathon Memorial featured a large collection of running shoes. Those same shoes were originally placed at the Boston Marathon bombing memorial within the weeks and months following the 2013 tragedy. Before those shoes were placed at the memorial they were purchased by a consumer, most likely for the purpose of running. And before the consumer’s purchase, those shoes were well crafted by an athletic corporation with running in mind. Athletic equipment is produced by a wide variety of major sporting corporations such as Reebok, Nike, Saucony, New Balance (you get the picture). Competition in this industry increased substantially over the course of the 20th century and is now totally off the hook in the 21st century. Designers spend countless hours crafting the perfect pair of running pants that glide easily or socks that keep feet dry. We don’t have to look any further than the U.S. speed skating team’s wardrobe crisis at the 2014 Olympic Games in Sochi. The skating suits, specially designed to increase speed, were supposed to be the most state of the art skating suits ever created. But in competition the team appeared to move slower because of a design flaw, an air hole in the back. The debate continues to rage about whether the suits actually did slow down the athletes, but the story certainly shows the amount of effort that goes into designing just one athletic garment. Each piece is made with intense care for a very specific purpose. In both exhibits the shoes displayed were originally made for walking or running. Shoe designers and cobblers made thousands of shoes that were purchased by individuals to protect their feet. Yet, the shoes could not protect them from violence. In 1940s Europe running feet stopped when the Nazis attacked. 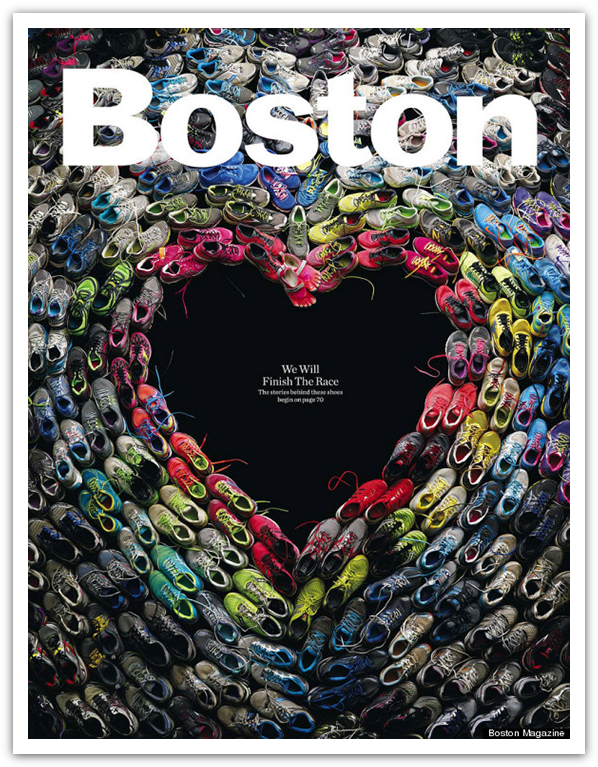 In 2013 the shoes of Boston marathon runners stopped when the terrorists’ bombs exploded. Clearly one difference lies in the purpose of collecting the shoes. 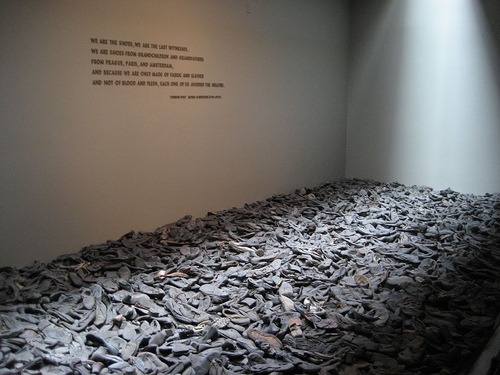 Shoes of Jewish citizens were originally confiscated in Europe at the hands of terror. The Boston memorial shoes were collected out of remembrance of those affected by terror. Regardless, the juxtaposition of an everyday object with the intensity of warfare drives home a more complex meaning. To this point Dr. Green observed, “It’s the mundane nature of the artifacts that give them their power.just about everyone has shoes of some kind, from flip-flops to high-dollar running gear.” The repetitive use of this one ordinary image is an effective way of communicating the large impact of a communal experience, forced or voluntary, in the face of tragedy. During this year’s race weekend Boston was filled with one other image that became a walking memorial. 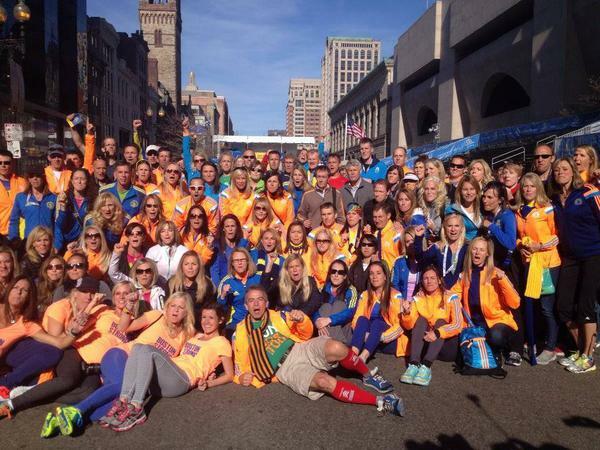 As a feature sponsor for the Boston Marathon, Adidas makes one very special athletic garment for the marathon. They design a jacket with those famous three stripes leading all the way down both arms. This year I was overwhelmed at the convergence of the, now famous, 2013 blue jacket with yellow stripes mixing with 2014 orange jacket with blue stripes. I am sure these symbols meant a lot of different things to a lot of different people. For me it marked the image of survivors from the previous year mixed with the image of hope for the coming race. Again, the jackets were made for a very specific purpose, worn by individuals, but collectively created a compelling statement. Representing these basic human emotions through a repetitive collection of one common object can be so simple yet so profound all at the same time. In all of these cases one message rings true- whether we walk as individuals or together, suffer alone or collectively, or compete for personal or group goals, we so often find our way towards a larger community at the end of it all- somehow gaining peace through mourning, reflecting, and rejoicing together. And it is what we are doing here on this blog- coming together as a collective to share and learn from one another. Feel free to join the conversation below, share your own experience, and engage in the experiences of those who are reading along side you.